Our hotel is located right on the Pigeon Forge Parkway, so you’ll be close to all of the great things to do in the area. What’s even better is that you’ll actually be within walking distance to a few of the best attractions, restaurants and shopping spots in the area. So, this vacation, leave your car parked in our underground parking garage and go for a walk to some of the nearby attractions. We’re within walking distance to: Wonderworks, Titanic Museum in Pigeon Forge, Smoky Mountain Opry, Hard Rock Cafe and more. One of the most popular is the outlet shopping in Sevierville because, in the summer months especially, it can be extremely busy. Since you’re close enough to walk, you won’t have to spend any time searching for a parking spot. When you’re ready to spend a day or night in Gatlinburg, we’re only a few minutes away. Just jump in your car or take a trolley ride through Pigeon Forge and into Gatlinburg. If you want to spend a day hiking, just continue through Gatlinburg and into the Great Smoky Mountains National Park. Plus, the drive through Pigeon Forge and Gatlinburg is great, too. You have a chance to see all of the great things to do in the area, plus you can always make a few stops along the way at some shops or attractions! At Mountain Melodies Inn, we want all of our guests to experience the comforts of home with extra amenities to make your vacation special. Our rooms offer private balconies with views of the mountains and Pigeon Forge area, fireplaces to keep you extra warm in the winter months, complimentary breakfast before you head out for the day and free wifi to keep you connected during your vacation. Our guests also love our hot tub and outdoor pool which is the perfect way to end a summer day. To learn more about all of our amenities at our hotel in Pigeon Forge, click here. 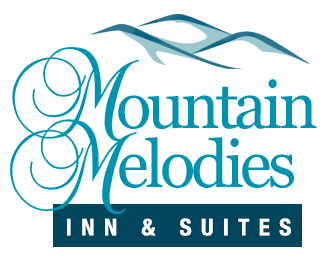 We know you’ll love your stay at Mountain Melodies Inn! Are you ready to start planning your vacation? Start by looking through our Pigeon Forge hotel rooms to decide which is best for you. We look forward to having you stay with us soon!